Details:	The radial gates of the dam are of the submersible type, with each gate being 10.2 meter x 12.8 meter in size. 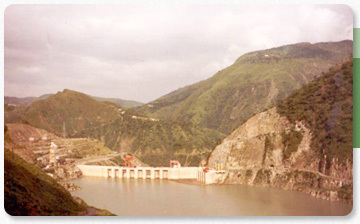 The gates rest on the crest of the spillway and are fixed to a trunion girder. Each gate is anchored with 96 high tensile bars of 36 mm diameter. The estimated force used for anchoring each gate was 9160 tonne with 48 prestressed bars provided on either side of the pier. Challenge: Some anchor bars showed signs of distress such as breaking and yielding. 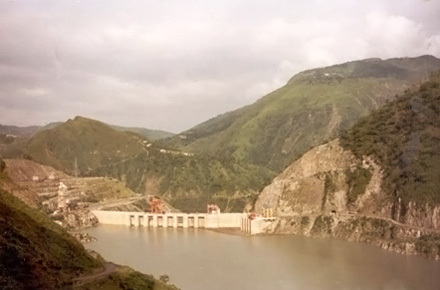 The existing bars were to be replaced with cable anchors, without affecting the existin arrangement of trunion girders, radial gates, piers and connected parts. Solution:	6 strands of 15.2 mm diameter were used in each hole. FPCC's new compact anchorage system was used to overcome space constraints. Strand cable was un-bonded.